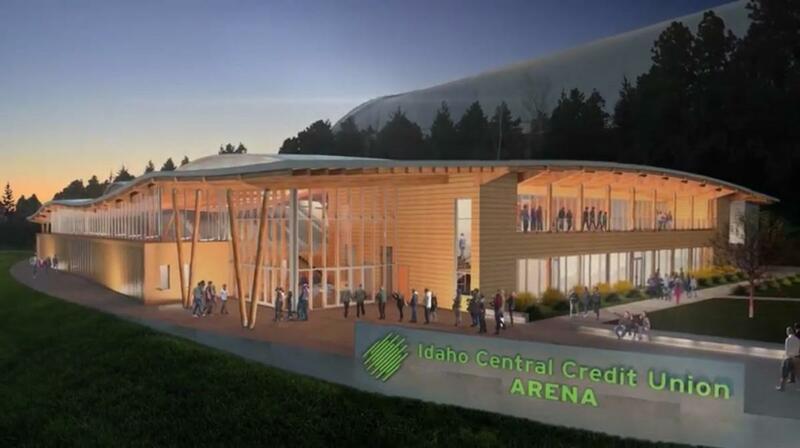 MOSCOW, Idaho – In the future, the University of Idaho’s planned Idaho Central Credit Union Arena will simply be a building, a well-appointed, tasteful home to men’s and women’s basketball games, concerts and convocations. Now, though, it is a vision of what architecture and wood can create. Most important, it is a bold statement of what UI can and should be, according to Michael Perry, UI special projects fundraiser who is responsible for getting ICCU Arena paid for. The $51 million project – $48 million for the building and the remainder for associated infrastructure improvements, such as new electrical service to the arena and to the Kibbie Dome and UI law school – will fulfill a facilities wish at Idaho for a new basketball venue that has been unrequited since 1969. On a field just north of the dome, the 4,200-seat arena, practice court, coaches offices, locker rooms, team lounge and alumni gathering room will rise from campus in flowing lines that mirror the rounded Palouse hills surrounding it. Built of wood harvested from UI’s Experimental Forest, some of it fashioned into massive laminated beams by Boise Cascade, and hauled by Jack Buell Trucking to a campus site prepared by Buell, the building will be nearly unique in the U.S. The partnership between a number of Idaho timber companies, industry associations and the university to build a mass timber arena is unheralded. The closest similar athletic site is the 8,000-seat Richmond Olympic Oval that hosted speed skating at the 2010 Vancouver Winter Olympics. StructureCraft Builders, which developed the roof design for the Richmond Oval, is also involved in UI’s project. The dramatic building attracted proposals from 15 architectural firms, Perry said. “The industry is buzzing,” he said. UI settled on Opsis Architecture of Portland as principal architect. Hastings and Chivetta, a firm with experience building arenas, will oversee the interior design, and KPFF Consulting Engineers, with an office in Boise, is on board as a consultant. Since seizing on a Seattle architect’s proposal several years ago for a wood-engineered arena using mass timber construction, UI is fulfilling its mission as Idaho’s land grant university and flagship higher education institution, Perry said. The university has inspired the Idaho timber industry and the U.S. Forest Service with a $250,000 grant to get behind a mass timber arena that will be a demonstration project for similar construction that can boost the industry, Perry said. The audacity to solicit seven-figure donations for a $51 million capital project signals UI has broken through to a new level of philanthropic expectation. So far, $38 million has been raised. The key gift is a $10 million donation from ICCU. It is the biggest donation in UI’s history. “We had the courage to ask for it,” Perry said. UI is working with a handful of other significant donors. The ICCU gift sets a benchmark for what the university is willing to pursue for this and future projects. The mass timber arena is coming into being because two UI administrators – who will not be at the university when the ICCU Arena is opened in 2021 – saw its possibilities and believed in it. Former athletics director Rob Spear was fired by the Idaho State Board of Education this year, and UI President Chuck Staben learned in May his contract will not be renewed at the end of the academic year. The announcement of the ICCU gift in January sparked a burst of excitement about the arena project. While that has quieted, behind-the-scenes momentum on the remaining fundraising continues unabated, Perry said. Idaho is committed to groundbreaking in April. Published: Oct. 4, 2018, 5:14 p.m. Updated: Oct. 4, 2018, 5:18 p.m.